Taroudant, Morocco: So how many camels are you worth? 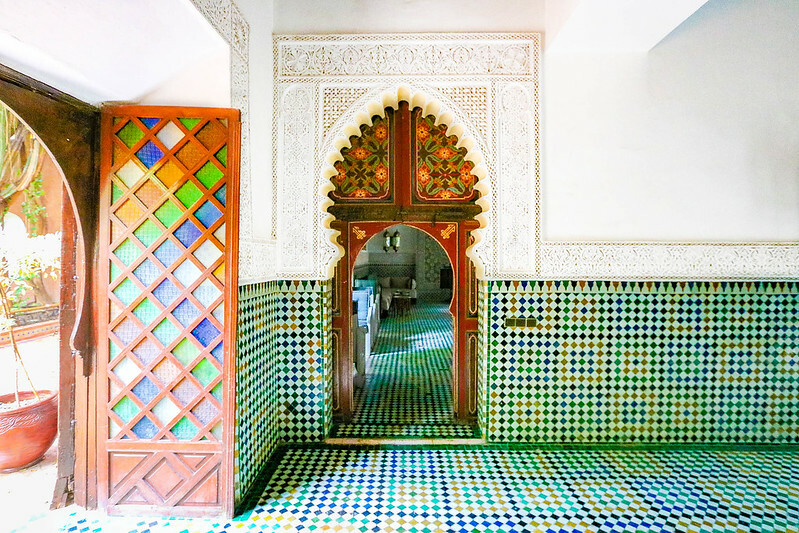 To me, Morocco has always seemed like a magical, majestic land with snake charmers, charming souks, mysterious alchemists and ancient history – which might have to do with how it’s presented in my favorite book “The Alchemist”. 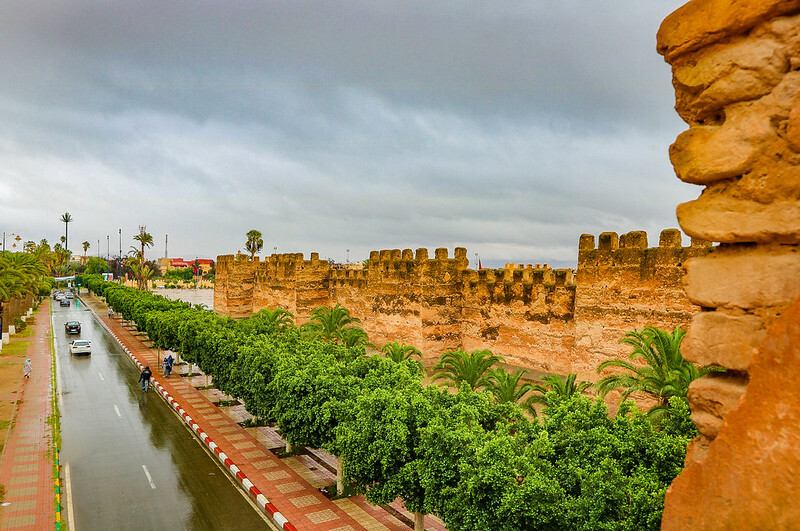 While Agadir is modern, the fortified Berber town of Taroudant, also known as “Little Marrakech”, is mystique. 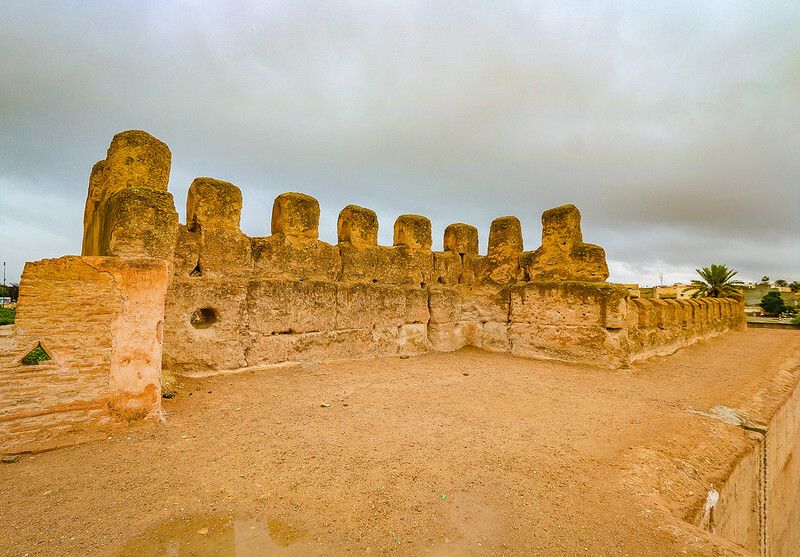 Taroudant has never really caught on with tourists and while its old city walls are some of the best preserved in Morocco, there aren’t any other must-see sights. 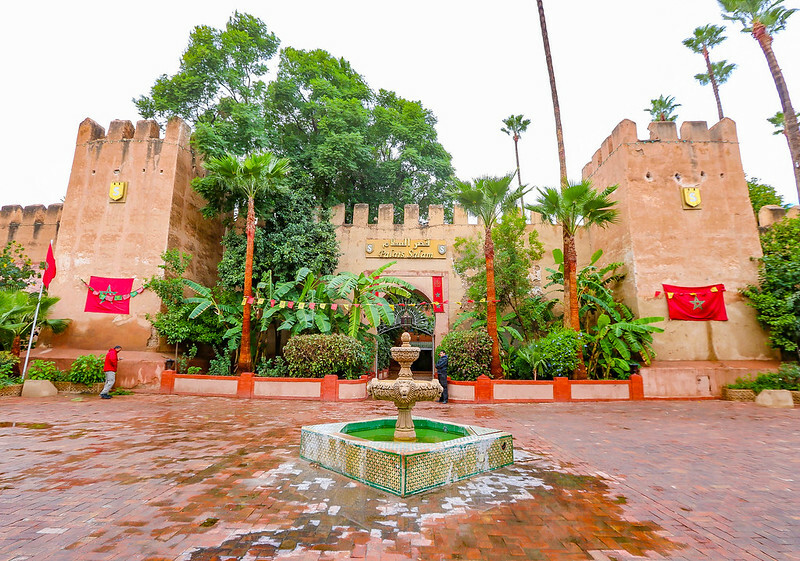 The very absence of attractions though has helped preserve the city, making it the perfect place to see everyday Moroccan life in a relaxed atmosphere. And, as I found out, it’s also the place to be asked if someone can buy you for however many camels. But we’ll get to that later. AT THE SOUK – HOW MANY CAMELS ARE YOU WORTH? 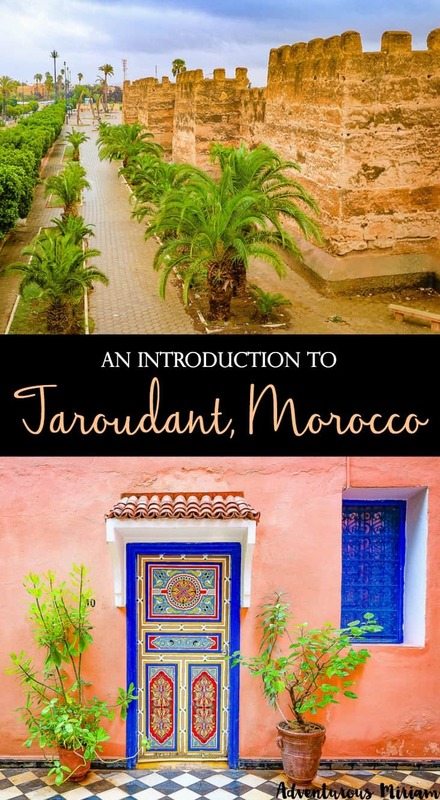 So, what’s your impression of Taroudant? Would you visit? 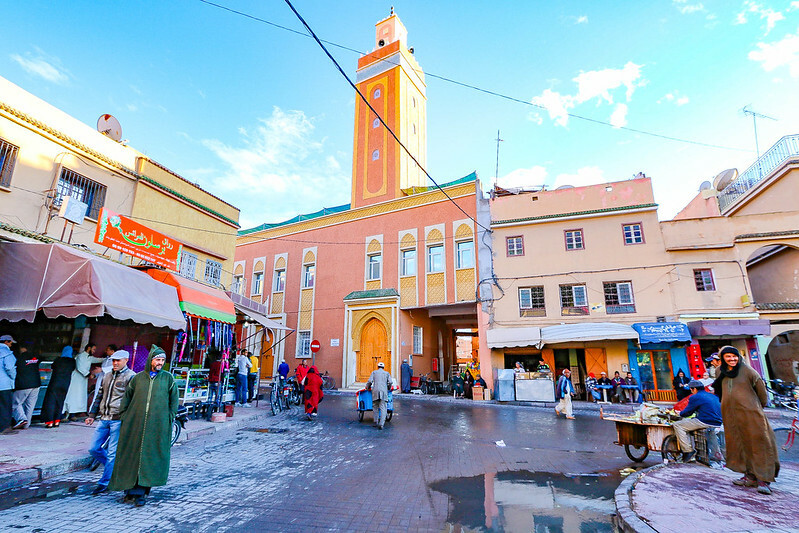 First, let me introduce you to the traditional Berber market town. Unlike Marrakech and Agadir, there are no stop lights here, no McDonald’s and no fancy luxury resorts. Taroudant is more laid back; well hidden in the Souss Valley and surrounded by fragrant orange trees with the snow-capped peaks of the High Atlas beckoning beyond. In the streets, lamb tripe dry in the open air, and horse carts take locals around town as a cheap alternative to taxis. 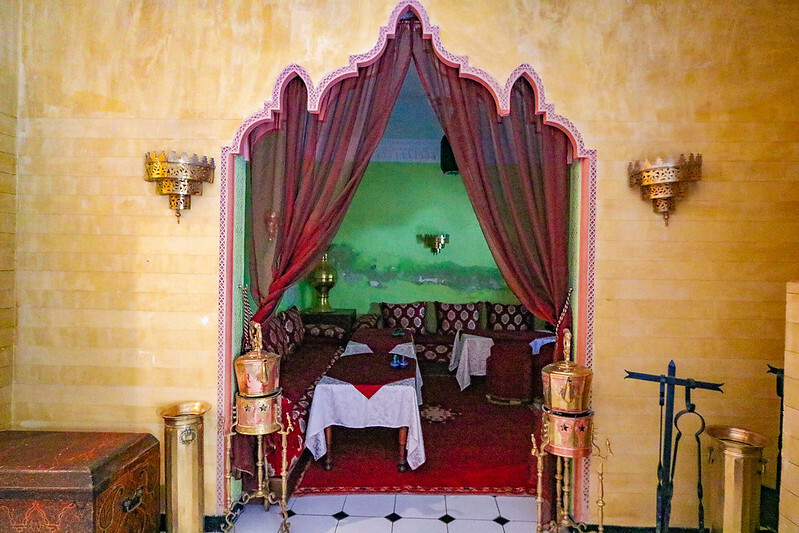 Taroudant has that traditional Moroccan feel, that’s for sure. The sole noteworthy monument in town is the medieval city walls. They’re 7,5 kilometres long, set with 130 towers, 19 bastions and punctuated by 9 gates that are still in use. 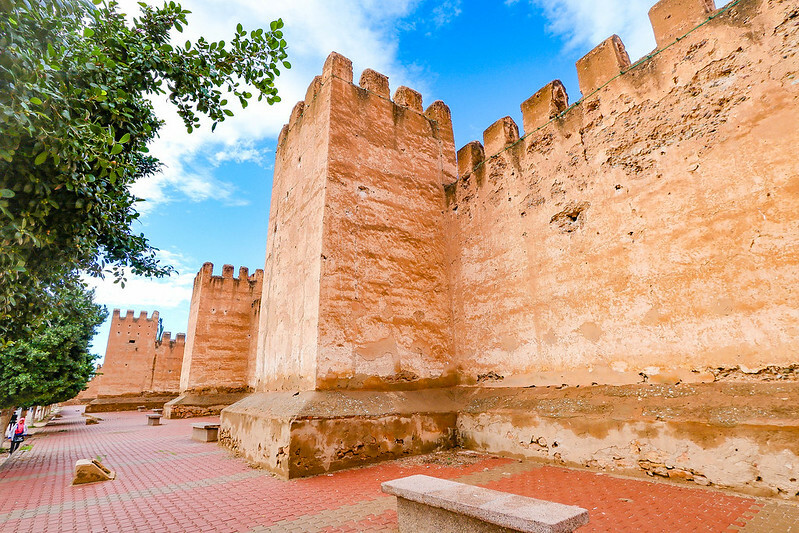 Walls and towers were built in the 16th and 17th centuries and kept in good shape. 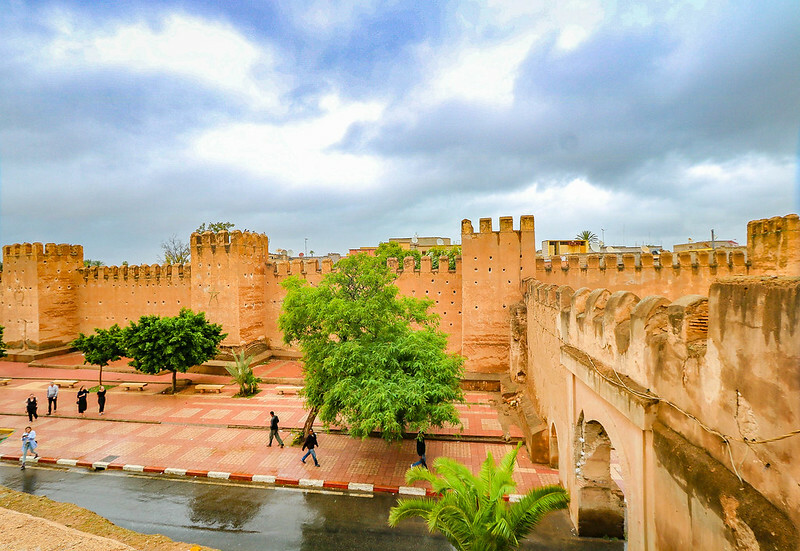 The triple-arched Bab el-Kasbah is the main gate from where you access the walls. It’s the only place in town where you can walk on them. 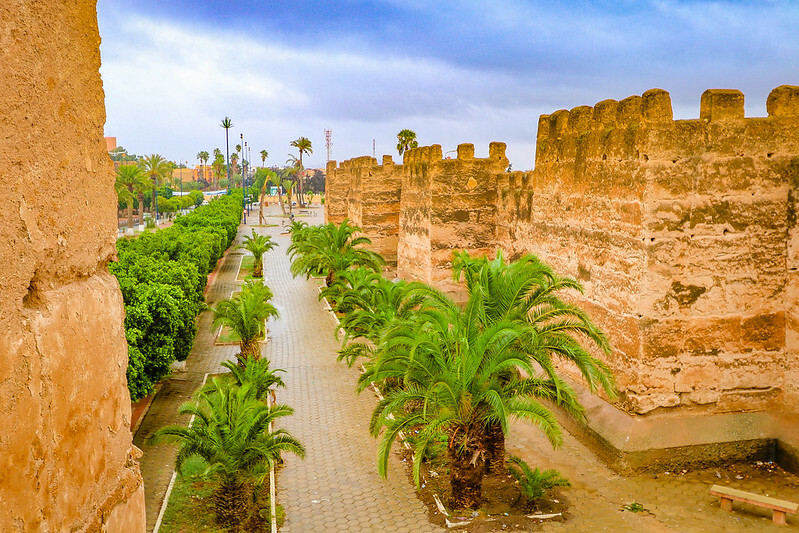 Aside from the city walls, souks are a fun attraction in Taroudant. 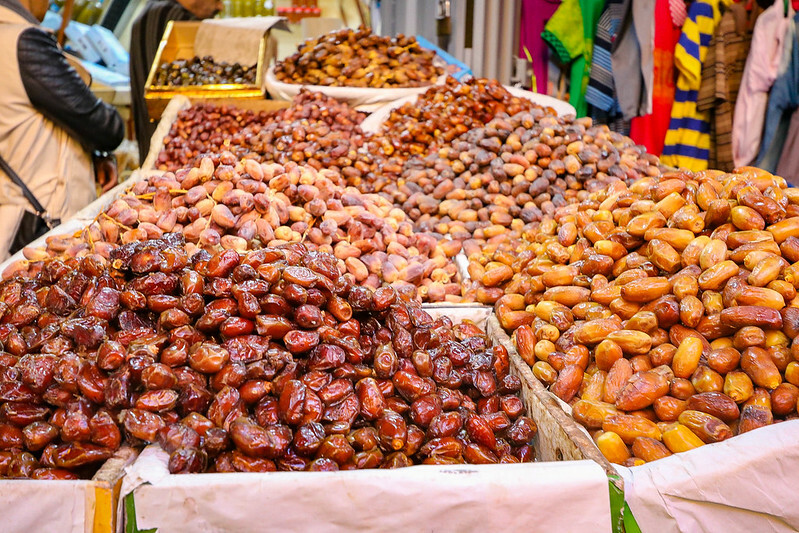 The souks sell all kinds of things: from traditional tagine pots and crafts to vibrant spices, wriggling lizards and Moroccan Argan oil. In the noisy alleys, women sell henna used for temporary tattoos during weddings or they give a henna tattoo on the spot. There’s a surprise around every corner. All souk vendors have the best quality and the best price. Or so they want you to believe. 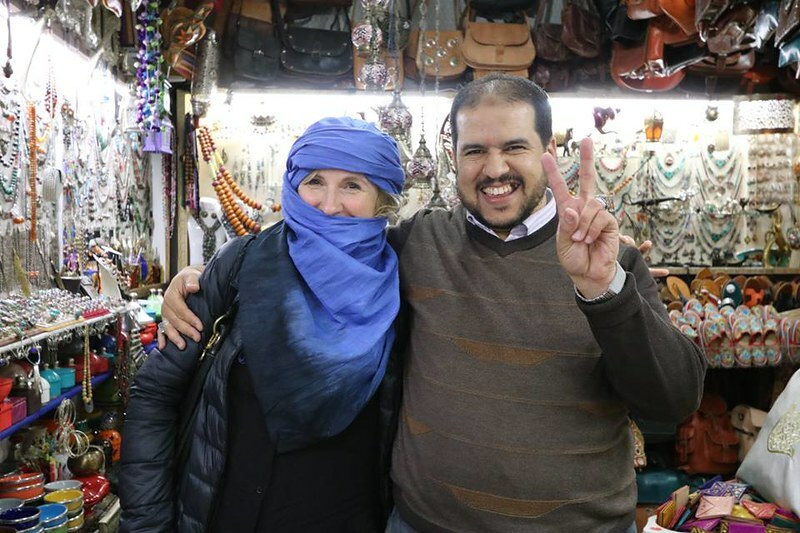 But the Taroudant sellers are known to be friendlier and less aggressive than their counterparts in Marrakech. I haven’t been to Marrakech yet, but I never felt hassled or pestered in Taroudant. On the contrary actually. Locals were eager to help when I asked for direction and several of them followed with us to make sure we got to the right place. In general, the souk vendors were very chatty and friendly. At one of the shops, this vendor tried to buy me for 100 camels. I never did manage to work him up to 1,000 camels, but then again where would Thomas put them in Denmark? 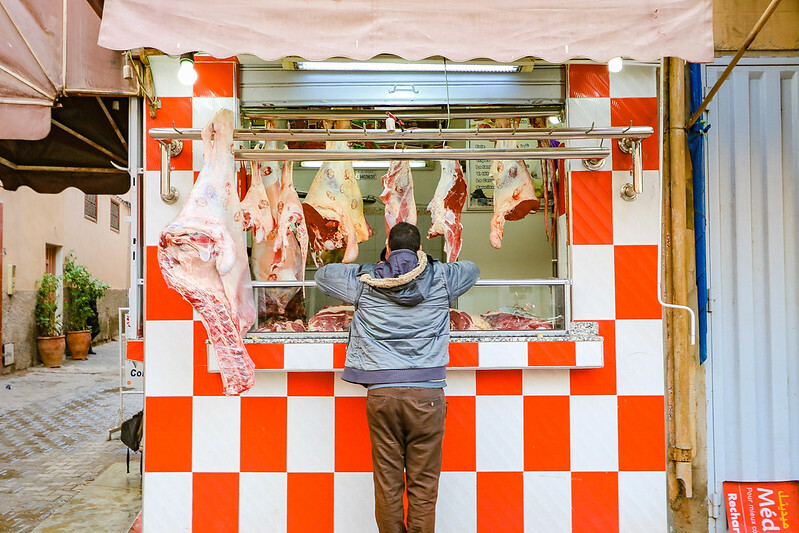 Taroudant has two main markets: a Berber market, called Jnane al-Jaami, that sells clothes, spices and dried fruits, and the larger Arab souk that specializes in jewellery, antiques and leather, but also has fish and meat. They’re located very close together (5 minutes walk). 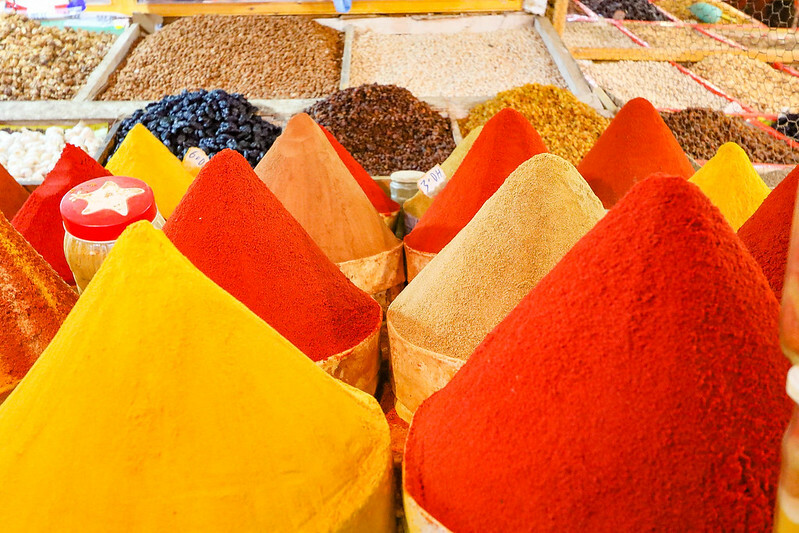 The thing I love most about Moroccan souks is the tantalizing smell of paprika, cumin, cinnamon and coriander that fill the air. It’s intoxicating. On Sundays, there’s also a weekend market just outside the city walls. You can buy a donkey or a goat there. 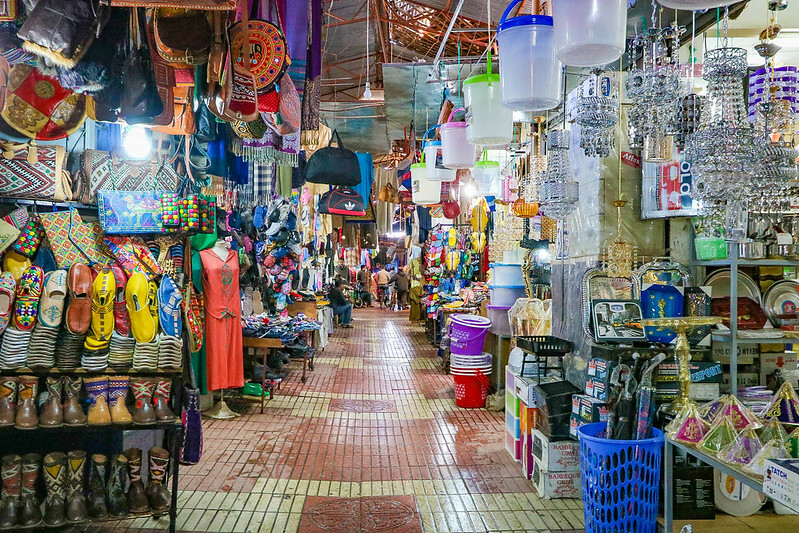 Clothes, food and handicrafts are also for sale – just remember to bargain. I’m a total sucker for Moroccan decor so having lunch at the Palais Salam was a major highlight. This place is an old imperial palace, built into the town walls. Inside there’s a tiled courtyard with fountains, a lush garden and patios, fruit trees and colourful hallways. 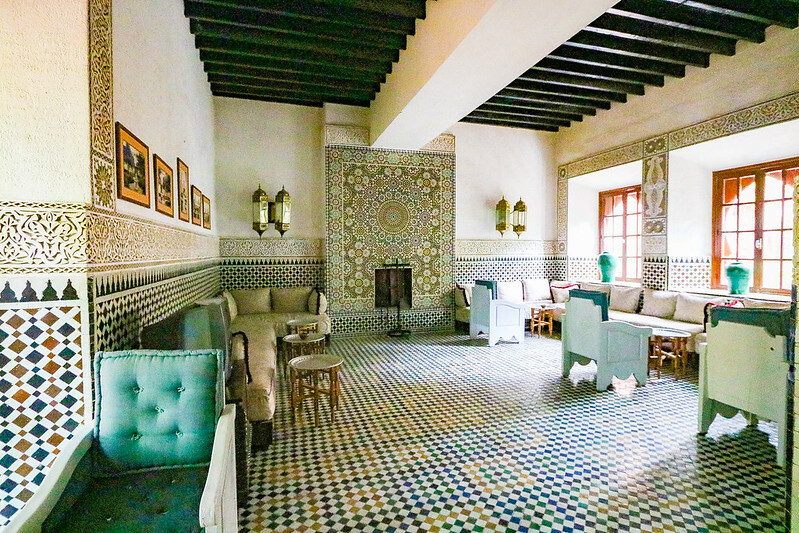 Rooms and interior are decorated in Moorish style, one part very traditional and the other more modern. 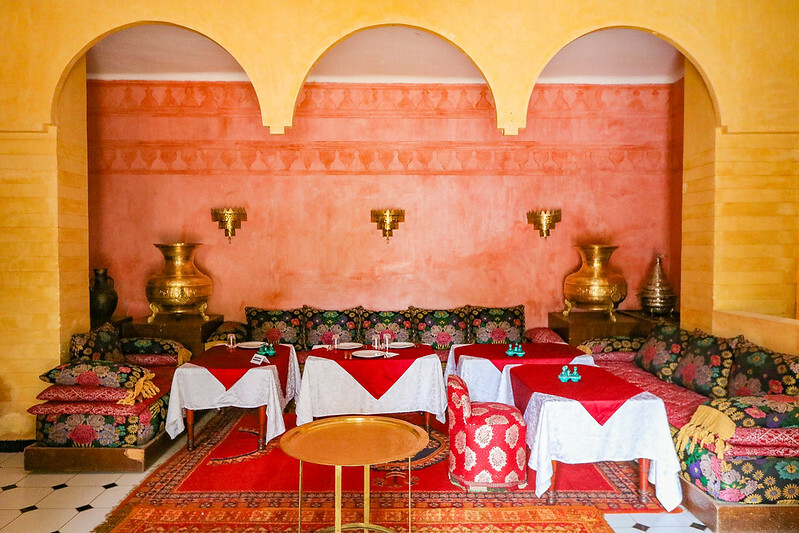 Palais Salam is the only 4-star hotel in Taroudant and it dates back to the 16th century. 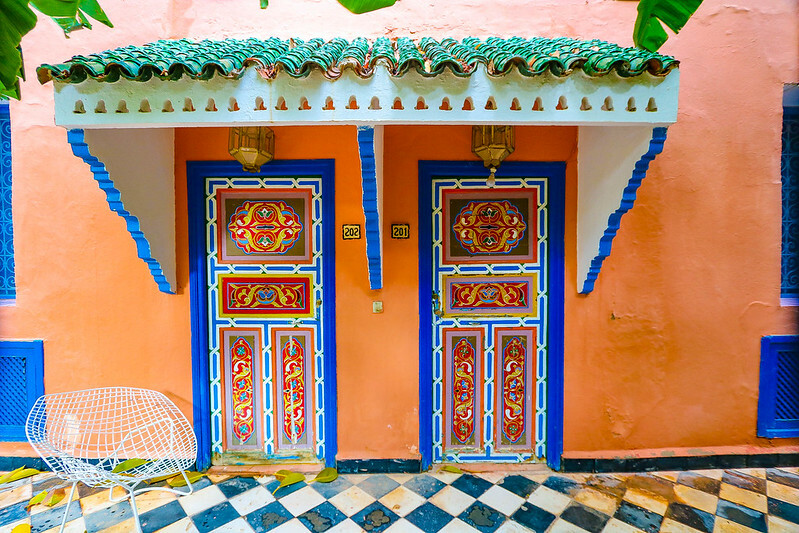 Once the former residence of the pasha of Taroudant, it’s now open to guests and it’s a lovely place to relax in the shade and see real Moroccan architectural style. Another thing I was drooling over at Palais Salam was the doors, which made this even more of a Moroccan paradise. 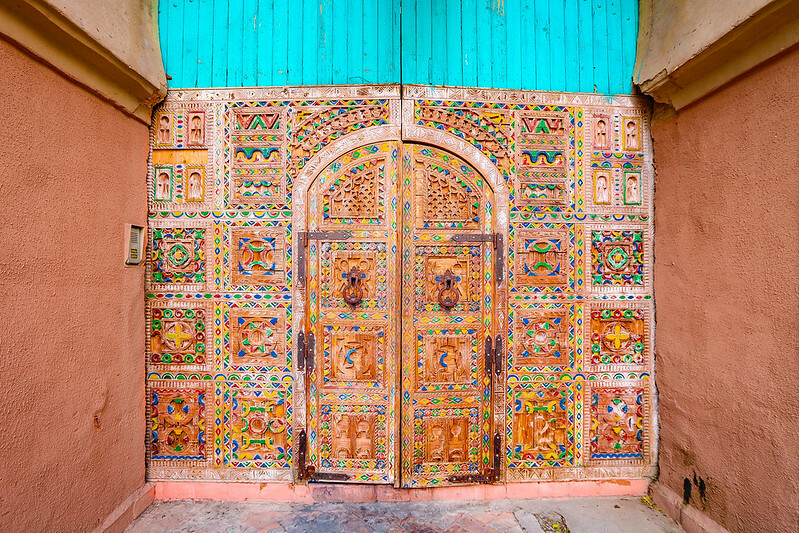 Moroccan doors are unique, and the amount of precision and detail make them an attraction in themselves. Most of them have arches, domes, decorative tile work and bold colours. Some doors are more than a hundred years old. 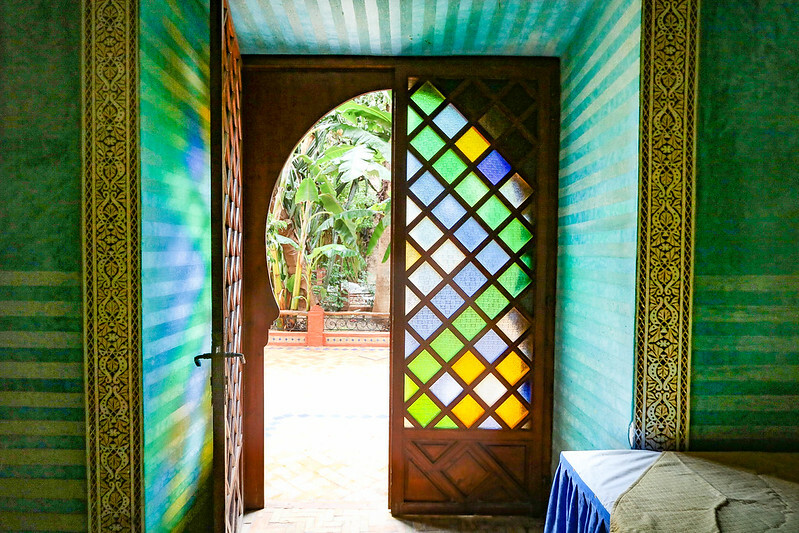 There’s just something about Moroccan style that’s magical and captivating. Maybe it’s because the decor is so exotic and warm. 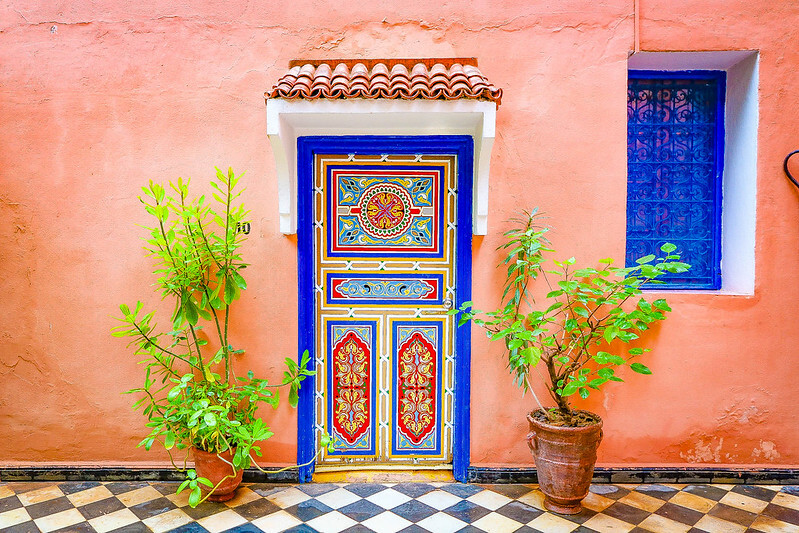 Vibrant colors, jewel tones, detailed tile works – entering a Moroccan home or traditional town is like being transported to another world. Photography advice: Most Moroccans don’t feel comfortable having their picture taken (religious reasons). So be aware of the local culture and ask permission before taking a picture if it’s a close-up. Sometimes locals, especially street performers, will ask for or expect a tip, but never give more than 10 Dirhams ($1 US). A thousand thanks to Moroccan National Tourist Office and Marokko Eksperten for hosting me. I was a guest on this press trip, but all opinions are my own as always. wonderful photos! 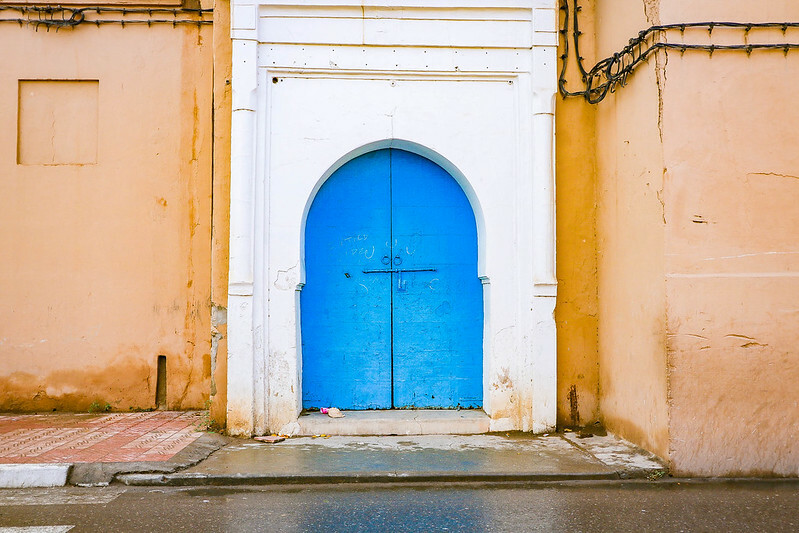 The city walls look very impressive… and those colored doors…wow! Thanks, Stephanie! Morocco is such a stunner. I was offered 100 camels for my daughter in Ait Ben Haddon. There is a great pizza place just outside the souq in Taroudant (my daughters lost their appetite when offered rabbit or chicken from the hutch for dinner at our riad). I hope you get to drive (or travel) on the road inland from Taroudant toward Ourrzazate and see the goats in trees “processing” the organ seeds. 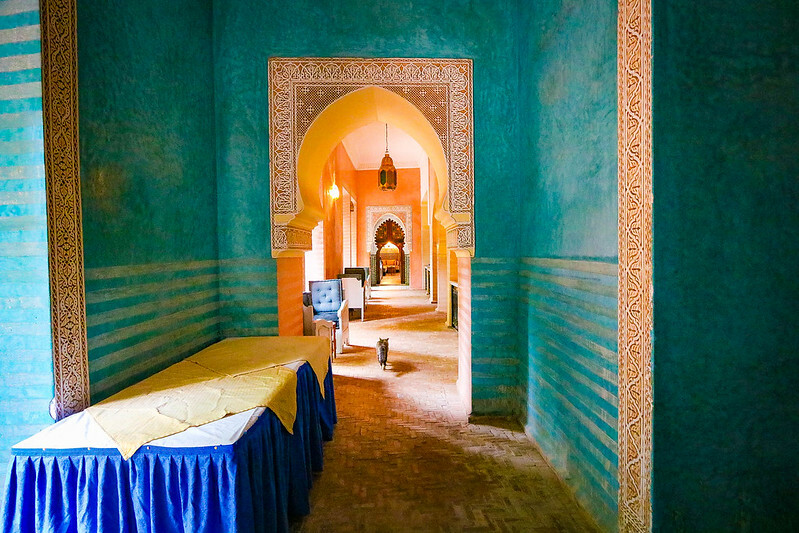 Sounds like there’s much more to see and experience in Morocco. I would love to see Ait Ben Haddou! What an amazing adventure! 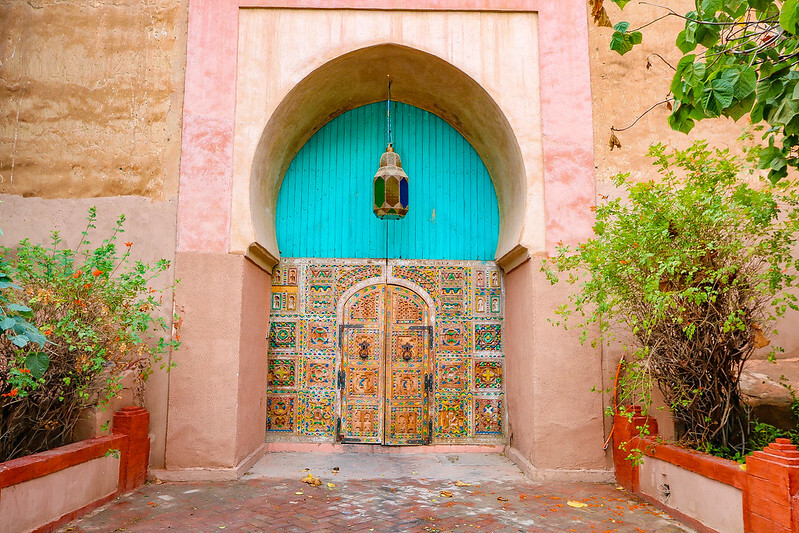 Morocco looks like a fascinating place to visit — so far I haven’t been in Africa, but will put this one on my bucket list. Definitely do. Morocco is amazing! 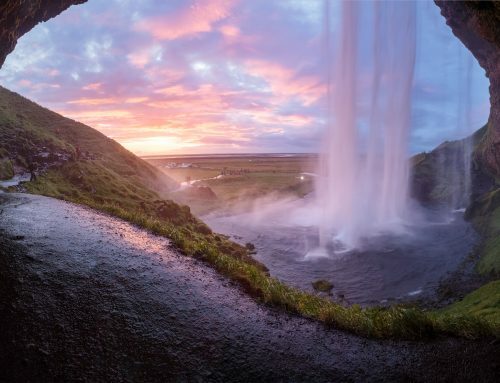 Sounds like an amazing place! The 100 camels thing is quite funny. Really makes me wonder about how many camels I’m worth… Your photos are amazing! Morocco looks so exotic and colourful!! 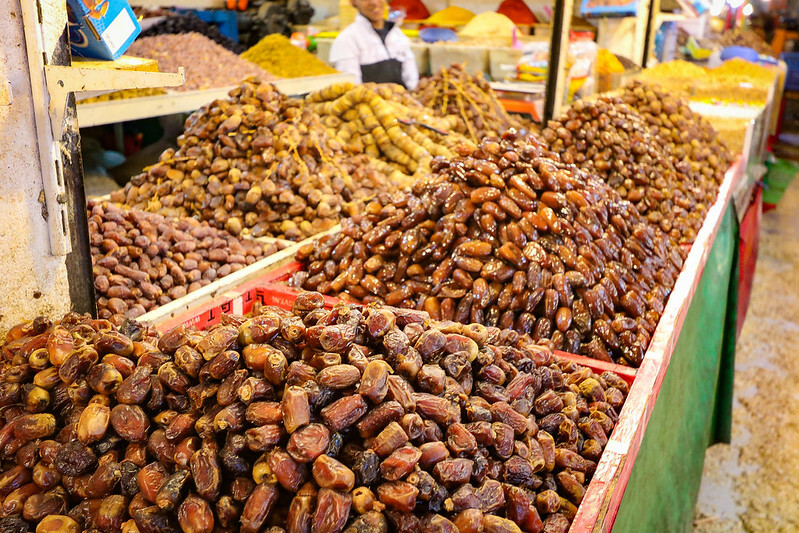 Love the architecture, vibrant market and pictures of the dates! A well-written article on TAROUDANT city, a city which hasn’t been discussed in much detail before. The city has been covered well too with a lens of the camera. Thanks, that’s really nice of you to say! 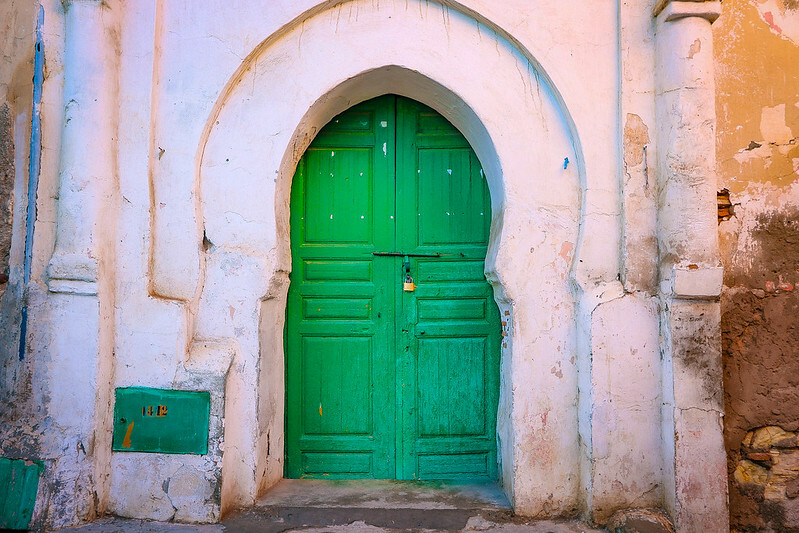 I liked the city because it seems so authentic – like the real Morocco. wow, you grabbed some stunning photos. 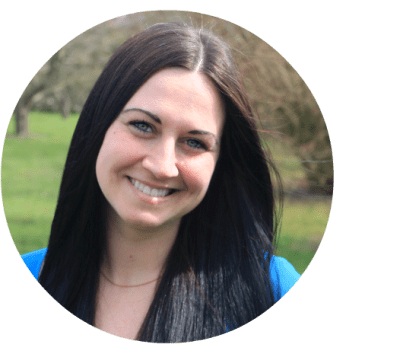 I am in the Travel productiveness, and argon oil is a hot item right now, cool to see photos of the organic knowledge you’ve had with the people who arrangement with these plants first hand. Hi Curley, I just spent a day there so I don’t have any hotel recommendations. Sorry. Depends what you are looking for in terms of comfort and price. But I’ve stayed in hotel Taroudant, right on the central square. Basic and clean, friendly staff. You can get food outside on the square. Price – about £15 per night. Thanks for pitching in, Tony! Just back yesterday after an amazing week holiday – lovely place and people and no one pesters – I was lost ( easy) twice and on both occasions locals shepherded me back to my guest house and refused payment for their time and trouble. I wore modest clothing and a headscarf as all women do – then stripped off down to the knickers in the Hammam for a hot bathe and scrub – magic. Sounds amazing, Liz! Would have loved to visit a hammam while I was there. Next time!